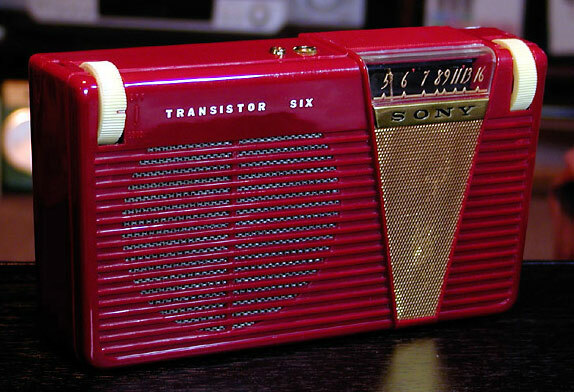 Totsuko released the TR-67 in November 1957 as an entirely new horizontal coat-pocket design I imagine was intended to replace the TR-66 in the product lineup. 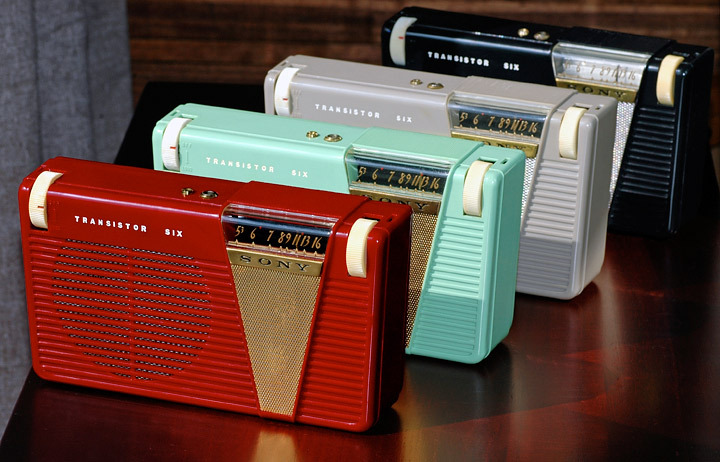 The new TR-67 featured a shorter, stockier cabinet distinguished by its large speaker area, gold-coloured "V" flash, reverse-painted slide rule tuning dial, and forward-mounted volume and tuning controls. Also note that the cabinet is not quite rectangular; the sides taper to make the bottom narrower than the top. Totsuko marketed the tuning dial as being easier to read and the knobs as easier to operate when the radio was being carried in a bag. The model listed for 12,300 yen, shipped with a spiffy blue leather carrying case, and was available in four colours: maroon, light green, light brown (tan), and black. I'm particularly fond of the maroon plastic's colour and shine, and of the funky reverse-painted characters on the tuning dial.